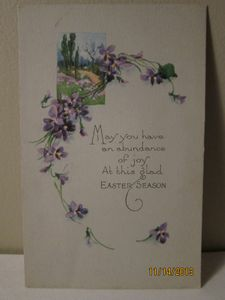 On the Front of the Card (Verse): "May you have / an abundance / of joy / At this glad / EASTER SEASON"
On the Back of the Card (Left Side): Published by the Gibson Art Company - Cincinnati, U.S.A. Publisher: The Gibson Art Company, Cincinnati, U.S.A. Written on the Card: "To Gladys / Wishing you a / Happy Easter"
For more cards of this type, please see the full list of "Easter" Postcards in the "Holiday" section. For a genealogical list (by last name of addressee) see the "Genealogy" section.